Two artists relatively new to the world of glass are at The Studio this month to experiment with and further develop their love for this fascinating material. Livvy Fink and Shari Mendelson during their residencies at The Studio. UK-based artist Livvy Fink is completely captivated by the idea of capturing “frozen moments” in glass. For her, it’s all about what lies beneath the surface, drawing inspiration from the depth and volume of glass. 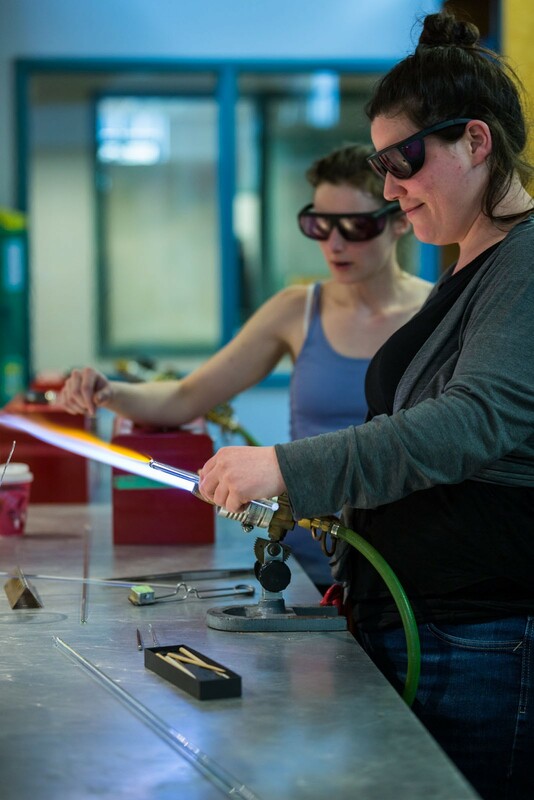 Having long worked with mixed media—both studying and teaching—she’s no stranger to the casting process, but after a trip to the Czech Republic, she developed a passion for glass, and found she was intrigued by glass casting. Fink studies a frozen moment. Fink examines her new work. Some of the pieces made during Fink’s residency. While at The Studio, Fink worked on a series of glass cylinders containing a bubble. Her goal was to examine the effect of time, temperature, and density on the glass, and how it impacted the movement of the bubble while it was in the kiln. Fink has recently been involved in a year-long project that came out of her desire to further understand what people saw in her work. While exhibiting an installation, she talked with people about what they saw—about 50% of onlookers saw cellular structures, while the other half saw galaxies. Livvy Fink’s cast glass, hot poured to catch reaction of gas given off from the mold, producing larger bubbles. A few months later, she was listening to the radio and heard an astrophysicist from the University of Cambridge Institute of Astronomy talk about the work he was doing in conjunction with oncologists from Cancer Research. She knew she had to be part of it. 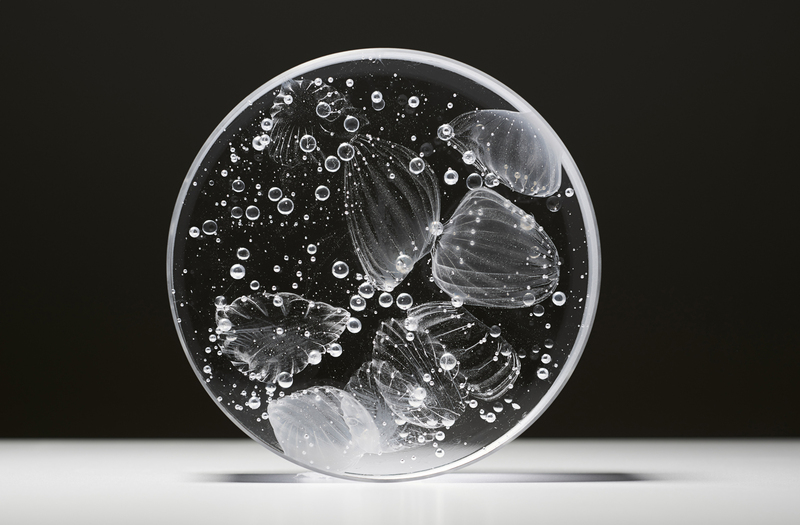 Through an award from the Welcome Trust Foundation, Fink collaborated with Cambridge to draw attention to their project by creating a series of new works “exploring how the imaginary space within a glass object can illustrate how both the hidden worlds of outer space and of the cells within our bodies are linked through a shared sense of wonder,” she said. Fink hopes to soon create installations for several hospitals, providing a brief respite—a few moments’ escape—for all who see her work. Livvy Fink works in the flame shop. Fink’s residency marks her first trip to the United States, and she couldn’t be more thrilled that her destination was The Studio of The Corning Museum of Glass. Fink has also found inspiration in the incredible glass collection right across the parking lot from her workspace. Shari Mendelson draws inspiration from the past. 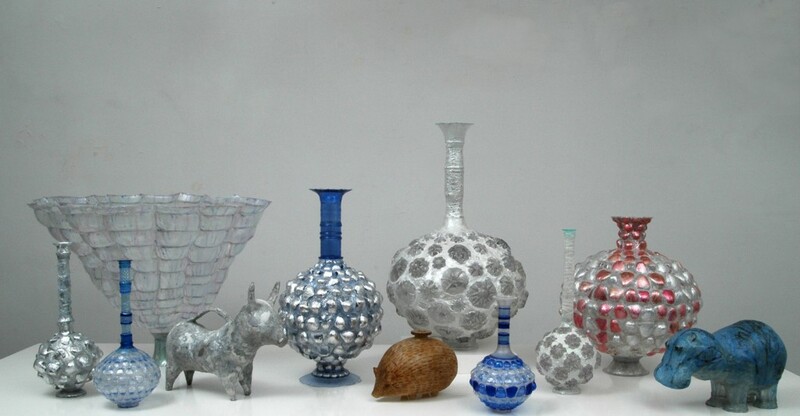 Using found plastic bottles, she creates small sculptures inspired by ancient Greek, Roman, and Islamic glass and ceramic vessels, as well as animal artifacts. 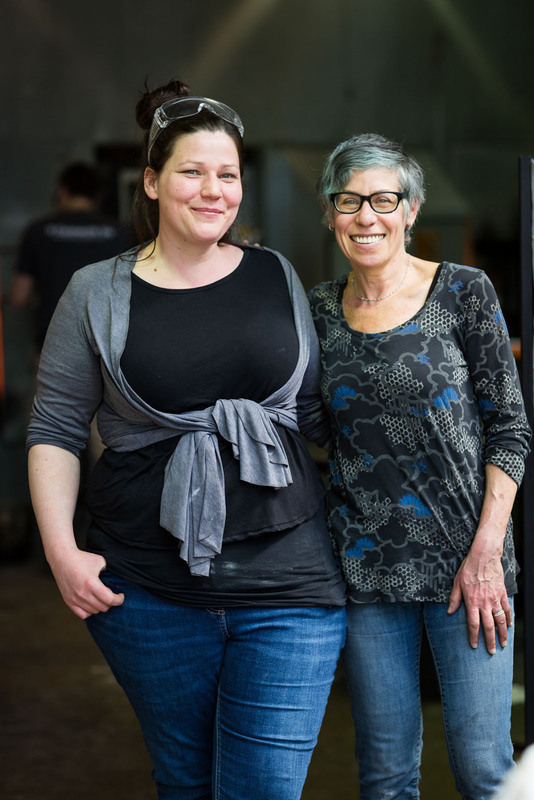 She has been doing this for six years—and is just starting to branch out into glassmaking. Mendelson’s visiting artist fellowship at Brooklyn’s Urban Glass last summer was her first foray into glassmaking, starting with a ten-week glassblowing class. She then experimented with making molds of her plastic pieces, and turning them into a series of mold-blown vessels with the help of glass artists. She continued this work, with a special emphasis on Roman and Islamic mold-blown glass, during her residency at The Studio this month. Shari Mendelson’s glass work prior to coming to The Studio. Several years ago, Mendelson came to The Corning Museum of Glass to look at the ancient works, and found herself completely inspired. She took dozens of pictures, which she continues to reference for her work today. Shari Mendelson’s wall of inspiration while at The Studio. Some of the pieces made during Mendelson’s residency. During her residency, Mendelson has had the opportunity to experiment with many different designs in ancient glass, working with gaffers to see if they can replicate work made thousands of years ago. A piece made during a session in the hot shop. Mendelson studies the work being made. Following her residency, Mendelson hopes to continue finding ways to emulate glass. Both artists will present a free public lecture to discuss their residencies this Thursday at The Studio from 12-1 p.m.